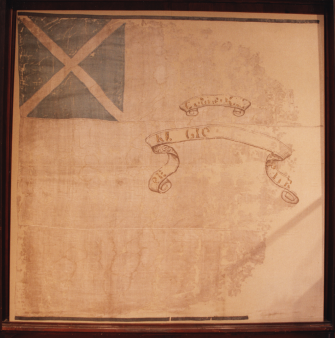 The Cumnock Covenanter Flag is on permanent display in the Biard Institute Museum in the town. It is thought to have been carried at Drumclog in 1679. It was found in a loft in Cumnock in 1830 and was carried at marches in the town at the Reform Bill in 1832. It was presented to the museum in 1925 and was restored in 1979. The Baird Institute Museum is located just off the Square in Cumnock town centre. It is open all year round on certain days. Access is free. For up-to-date opening times, see the museum website - click HERE.